Bliss Brands has launched Rigor Thick Bleach, a thick liquid bleach that knocks germs dead and protects for up to 24 hours. What’s more it has a long lasting fragrance that will have your home smelling fresh and clean for longer. Another benefit is that it is a thick bleach, so it clings to surfaces for longer, allowing its disinfectant benefits to last longer. Rigor Thick Bleach comes in three variants, each with a fresh, clean fragrance – Coral Breeze, Lavender Burst and Morning Dew. 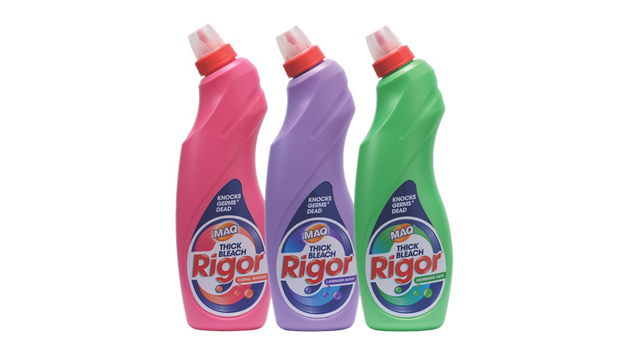 Rigor Thick Bleach is perfect for cleaning kitchens and bathrooms. It effectively and quickly removes stubborn dirt while it disinfects surfaces and kills germs. For moms who take pride in their home, Rigor Thick Bleach is your housecleaning friend! Rigor Thick Bleach is available at all good supermarkets countrywide. Bliss Brands is giving away Rigor Thick Bleach in three amazing variants – Coral Breeze, Lavender Burst and Morning Dew – as well as cleaning essentials including cloths and an apron. The prize is valued at: R350.00! Simply follow the easy instructions below to get your entries in! Winning this hamper will help ease on our cleaning budget for the Home for abandoned babies that I manage.. I have a little three year old who just can’t resist exploring all areas in the house. When I win this hamper it will ease my mind that at least he’s not that much exposed to germs and my house will be smelling fresh!! !